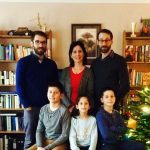 The Edwards family has been serving Jesus and His church in Hungary since 1993. Since 2006 they have been planting a church in Tatabánya, a city that desperately needs one. They are busy with a variety of ministries you would expect from a church planter: Friendship and street evangelism, Bible teaching, worship, youth ministry, moms and tots, women’s ministry, translation, English clubs, hospitality, nursing home visitation and hosting house concerts. They have three kids, Oliver, Benjamin and Miriam, one bonus kid, Richard, and a dog, Indy.